Some presume that the effects of pet stress on dogs and cats are not much different than those on other non-human animals. But, it appears that they’d be wrong. In the mammalian world, dogs and cats are unique due to the bonds they share with humans, marked by their social interactions and the human homes in which they commonly reside. As dogs and cats have gradually changed from living in natural settings to co-habitating with humans, one might expect that they would have fewer stressors than their outdoor ancestors. However, the evidence seems to contradict this assumption. Some veterinarians argue that, even though environmental stress is lower for today’s companion animals (i.e., less risk of predation, starvation, etc. ), overall stress levels are actually higher. 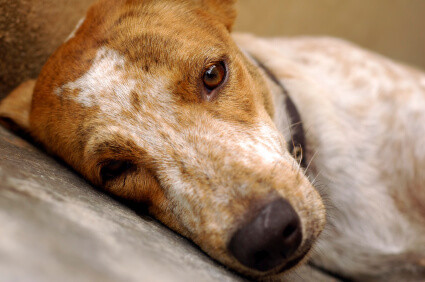 Furthermore, current sources of stress – such as boarding, veterinarian examinations, long-term confinement in a crate, boredom, habitual inactivity and even the sounds of modern life – are ones against which dogs and cats may not have well-developed defenses and are often unavoidable. Stress has been eloquently described as “the sum of all nonspecific biological phenomena caused by adverse conditions or influences. These include physical, chemical, and/or emotional factors to which an individual fails to make satisfactory adaption and that cause physiological tensions that may contribute to disease” (Campbell et al, 2004). Bodies manage stress through the autonomic nervous system and the endocrine system (referred to as the “hypothalamic-pituitary-adrenal axis”). In general, the response of the autonomic nervous system is very rapid and specific, whereas the endocrine system adjusts more gradually and is broader in its effect. In order to mount an adequate stress response, both the autonomic nervous system and the endocrine system require nutrients that can only be obtained through dietary intake. For example, the endocrine messengers (norepinephrine, acetylcholine, and cortisol) are synthesized by the body. However, in order for the body to create these messengers, it needs to obtain tyrosine, choline and acetate, as well as cholesterol and acetate . . . all from dietary sources. Synthesis of these endocrine messengers is also dependent upon ingesting nutrients such as zinc, copper and manganese, as well as significant amounts of vitamin C. In the autonomic nervous system, signal transmission is made possible by electrical activity in the nerve cells. Fueling this activity requires dietary intake of sodium, calcium and potassium. All of these elements are vital for normal nervous and endocrine system responses to stress. As a holistic pet food formulator, I know that the way the body responds to stress and chronic disease might have predisposing nutritional factors, such as a nutrient deficiency, imbalance, or toxicity. A good formulator must know whether or not supplementation of a given nutrient can help a companion animal manage stress effectively. In spite of how well you care for your dog or cat, it is still likely that they will encounter daily stressors. While unavoidable, it is possible to minimize the effects through a combination of exercise, nutrition and holistic treatments. Substances like valerian, chamomile and inositol can help to soothe the jangled nerves of dogs. Pheromone diffusers and sprays are effective stress reducers for both dogs (D.A.P) and cats (Feliway). If your budget is tight, you can do pet massage at home to help relieve tension. To develop a program of stress reduction that’s uniquely suited to your companion animal’s needs, consider enlisting the help of an alternative-medicine or holistic veterinarian. Perhaps most importantly, keep in mind that providing proper nutrition is vital for helping companion animals deal with stress and lead long, healthy and happy lives. In addition to feeding a high quality diet, feeding them a daily supplement is a simple way to ensure sufficient nutrients to maintain a healthy endocrine and nervous system, in turn helping to cope with any stress your pet encounters. Thank you for all you do to make the world a better place for companion animals. Each and every one of you has my sincerest wishes for holiday full of joy, and a wonderful new year of health! Dr. Jane Bicks, read more about her. Campbell, K.L., J.E. Corbin and J.R. Campbell. 2004. Companion Animals: Their Biology, Care, Health, and Management. Pearson Education, Inc., Upper Saddle River, NJ. Cameron, M.E., R.A. Casey, J.W.S. Bradshaw, N.K. Waran and D.A. Gunn-Moore. 2004. A study of environmental and behavioural factors that may be associated with feline idiopathic cystitis. J. Small Anim. Pract. 45:144-147. Luescher, A.U. 2003. Diagnosis and management of compulsive disorders in dogs and cats. Vet. Clin. North Am. Small Anim. Pract. 33:253-267. DeNapoli, J.S., N.H. Dodman, L. Shuster, W.M. Rand and K.L. Gross. 2000. Effect of dietary protein content and tryptophan supplementation on dominance aggression, territorial aggression, and hyperactivity in dogs. J. Am. Vet. Med. Assoc. 217:504-508. Dodman, N.H., I. Reisner, L. Shuster, W. Rand, U.A. Luescher, I. Robinson and K.A. Houpt. 1996. Effect of dietary protein content on behavior in dogs. J. Am. Vet. Med. Assoc. 208:376-379. Casey, R. 2002. Fear and stress. In: BSAVA Manual of Canine and Feline Behavioural Medicine. (D. Horwitz, D. Mills and S. Heath, eds.) British Small Animal Veterinary Association, Gloucester, England. pp. 144-153. Glickman, L.T., N.W. Glickman, D.B. Schellenberg, K. Simpson and G.C. Lantz. 1997. Multiple risk factors for the gastric dilatation-volvulus syndrome in dogs: a practitioner/owner case-control study. J. Am. Anim. Hosp. Assoc. 33:197-204. Gue M., T. Peeters, I. Depoortere, G. Vantrappen and L. Bueno. 1989 Stress-induced changes in gastric emptying, postprandial motility, and plasma gut hormone levels in dogs. Gastroenterology 97:1101-1107. Hennessy, M.B., V.L. Voith, T.L. Young, J.L Hawke, J. Centrone, A.L. McDowell, F. Linden and G.M. Davenport. 2002a. Exploring human interaction and diet effects on the behavior of dogs in a public animal shelter. J. Appl. Welf. Sci. 4:253-273. Hennessy, M.B., V.L. Voith, J.L. Hawke, T.L. Yound, J. Centrone, A.L. McDowell, F. Linden and G.M. Davenport. 2002b. Effects of a program of human interaction and alterations in diet composition on activity of the hypothalamic-pituitary-adrenal axis in dogs housed in a public animal shelter. J. Am. Vet. Med. Assoc. 221:65-71. Sheppard, G. and D.S. Mills. 2003. Evaluation of dogappeasing pheromone as a potential treatment for dogs fearful of fireworks. Vet. Rec. 152:432-436. Simpson, J.W. 1998. Diet and large intestinal disease in dogs and cats. J utr. 128:2717S-2722S. Takeda, E., J. Terao, Y. Nakaya, K. Miyamoto, Y. Baba, H. Chuman, R. Kaji, T. Ohmori and K. Rokutan. 2004. Stress control and human nutrition. J. Med. Invest. 51:139-45. Kim, YM, Lee JK, Abd el-aty AM, Hwang SH, Lee JH, Lee SM. Efficacy of dog-appeasing pheromone (DAP) for ameliorating separation-related behavioral signs in hospitalized dogs. Can Vet J. 2010 Apr; 51(4):380-4.